Spreading weird cheer since 1969. “Mike, you mentioned some time ago that quite a few of your customers don’t spend time on the Internet reading articles or blogs about comics. Do you notice a difference in how they respond to things like Big Events or ‘shocking’ deaths, or things like creative team changes? That’s…getting harder to determine, actually. As pretty much the sole pilot of this particular retailing ship, I interact with literally every customer who comes through the door, and it seems like just about everyone has some online awareness. There are a couple of customers I’ve known for years who had previously always been the “seeing it on the rack is their news” folks are now paying more attention to online comic news venues and YouTube channels and the like. I mean, I still have a couple of customers who pretty much just stick to the weekly Comic Shop News to keep informed far as I can tell, but it seems like of late internet news/reviews sources have been more fully integrated into the comics shopping experience. I don’t know if anyone’s really caught off-guard any more by particular turns of events…well, I mean, they are, but it’s, like, two or three months ahead of the book being available for sale, it seems. Dan is of course referring to these peculiar incidents from, urgh, eight years ago now, where a group of young gals kept leaving trinkets and ribbons and…well, you can read about it there. Alas, John Law never caught up with them, and far as I know, they still roam the lands, traveling from comic shop to comic shop to spread their particular form of weird cheer. Sure, if they’re good! The Flintstones was a remarkable bit of dark satire that, if I may more or less paraphrase what I’ve said about it before (because I’m too lazy to look up my exact wording), sounds like a bad idea on paper but absolutely sticks the landing. The current Snagglepuss comic is just about as strong a book so far, two issues in. The Dastardly & Muttley mini-series was completely bonkers, and the still-ongoing Scooby Apocalypse remains a very strange but thoroughly entertaining book. Now, the question I think you’re maybe asking is “do we need adult versions instead of kids versions,” and, yeah, ideally there would be. Well, okay, two-thirds of the available monthly Scooby-Doo comics are all ages, but part of the problem is if there would be a perceived market for an all-ages Dastardly & Muttley series, or an all-ages Snagglepuss series. I’m sure there is, or that one could be built, but the “adult” gimmick is the strategy that would get them attention and sales more quickly. It’s marketed to adult readers’ nostalgia, since nobody’s doing new, say, Snagglepuss cartoons to any real extent, compared to Scooby-Doo, which is still generating new cartoons even today, keeping the property in front of children’s eyes. Sold pretty well, as I recall. And CrossGen had this thing where you could order and maintain a backstock on issues, either directly from them or some mail order outfit they were partnered with (don’t recall, exactly), so that readers could always get in the ground floor. Plus they had a good trade paperback program, getting those issues collected right away. Now, I didn’t read too many of them…I read El Corazon , their pirate comic, and Abadazad , J.M. DeMatteis and Mike Plogg’s fantasy series, and I enjoyed both of those. Their earlier mainline books, like Scion or Crux or whathaveyou, I didn’t get into, though I’d flip through ’em as they came in and they all looked perfectly fine. Just, you know, didn’t have the time, or they didn’t really grab me, for whatever reason. The two I wish I did read were the Sherlock Holmes-esque Ruse , or the well-regarded horror series Route 666 . Both of those sounded right up my alley, and I kind of regret not picking them up at the time. Well, What Can You Do? I don’t really have any requests for these titles today…I have a few around the shop, and even some in the bargain bins, but I haven’t had anyone asking me for any CrossGen of late. Marvel’s attempt at a brief revival a few years back never went anywhere, unfortunately, since I think there’s probably still some potential in these properties. 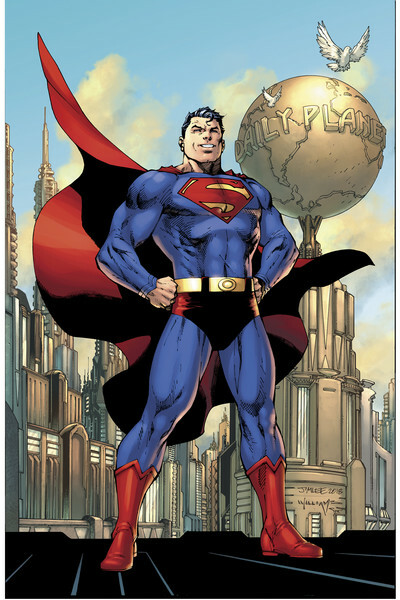 “re: [Superman’s] red trunks – Are they really changing them? Okay, and that finally wraps up this latest round of Question Time. Thanks for your patience, everyone, and I promise, I won’t take so long next time. Thanks for reading, and I’ll see you next week. Re: the new/old super suit – it has stripy cuffs on the sleeves! They’re new aren’t they? Otherwise I got nothing. Is the belt buckle different? I do not remember it looking that way, but I have not paid attention in awhile. If that is a buckle. Given that it simply occupies the center of an otherwise unbroken piece of material, it appears to be merely a decoration rather than something actually functional. Thanks for your detailed answers, I knew you’d get around to my questions sooner or later. Glad to hear about the youngsters plunking down their cash for comics, there might be some paperbased future for this hobby after all. Now that I’m looking at the belt, I’m not sure if I’ve ever noticed Superman’s belt feeding through belt loops before. Is that new?